System Name: Display this System Name of SNMP Client. System Contact: Display System Contact Person on SNMP Client. System Location: Display System Site on SNMP Client. Receiver IP Address: The Trap will be sent to this IP Address. Receiver Port: The connection port for the trap server. Default value is 162. Community: The group that will be sent to the trap server. Answer Ring : The RPS-SP4L Unit will answer the phone after this set number of rings. Upon answering, you will be prompted to enter your passcode consisting of a FIXED LENGTH 6 digit number. You configure your password in the ACCOUNT Menu area. 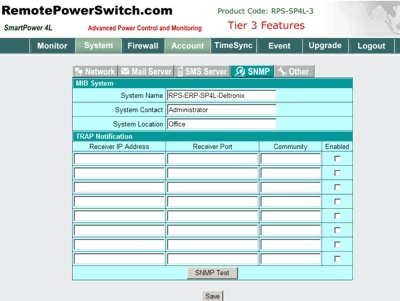 Depending on what Tier level you purchased, up to 4 user accounts can be configured on an INDIVIDUAL BASIS for access to specific power ports on the RPS-SP4L. The user access applies to power control over the telephone OR web. Reboot Option: By checking this option, the REBOOT function on the main login screen will be checked by default. See the Main Screen Instructions. Operation Idle Time: Specifies the amount of idle time allowed before the user is automatically logged off the remote power switch. Temperature Kind: Set the unit to Degree F or Degree C for its internal temperature monitor. 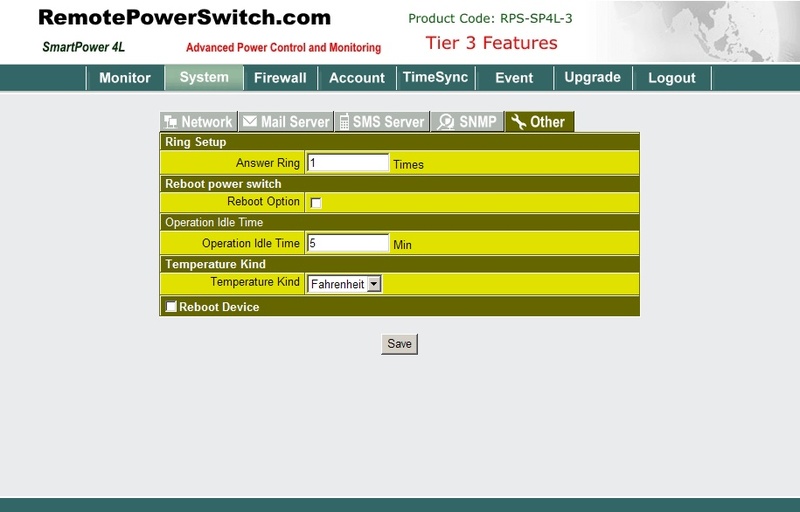 Reboot Device: Check off the box and click the SAVE button to reboot the RPS-SP4L remote reboot unit. 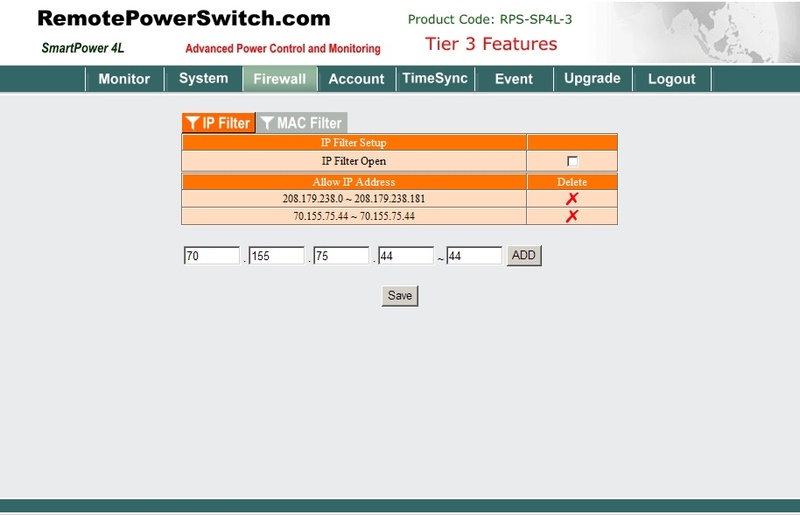 The above screen allows you to configure the built in Firewall IP Filter Option. 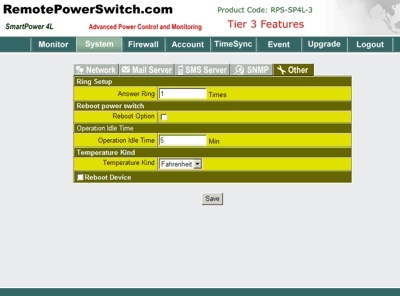 IP Filter Open: If checked ONLY the below configured IP addresses will be able to connect to the remote power switch. 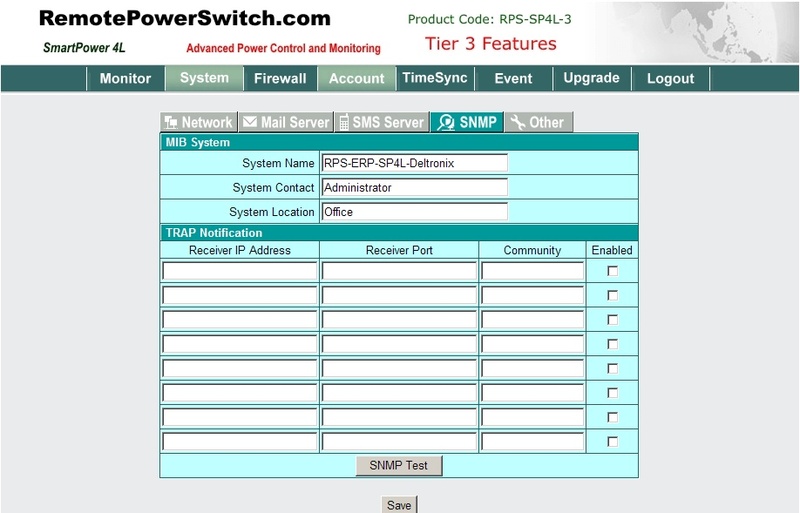 Select your IP address range to limit access to the RPS-SP4L unit. When the above Ip Filter Open Option is checked, only these specified IP address ranges will be able to connect to the unit. Click add to add your address range and SAVE to write the information to the device. The above screen allows you to configure the built in MAC Filter Option. 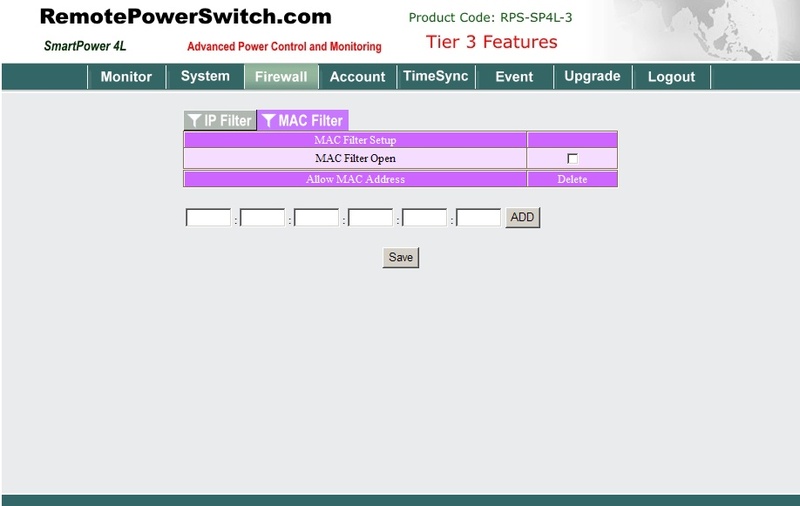 MAC Filter Open: If checked off ONLY the below configured MAC addresses will be able to connect to the remote power switch. Enter your MAC addresses to limit access to the RPS-SP4L unit. 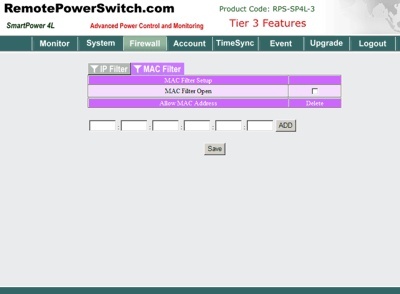 When the above MAC Filter Open Option is checked, only these specified MAC addresses will be able to connect to the unit. Click add to add your MAC address and SAVE to write the information to the device.